INTRODUCTION: Mrs M.G. is a 64 year old lady with a 15 year history of T2DM, who was being managed with oral triple therapy, Pioglitazone and Glucovance. Her weight was 154.5 kg and BMI 57.2. Being morbidly obese M.G. had a very poor exercise tolerance and was suffering from a lack of self-confidence, affecting all areas of her life such as ADL’s, household chores, physical activity, relationships and psychological wellbeing. TREATMENT: Initially the TZD Pioglitazone was ceased and M.G. 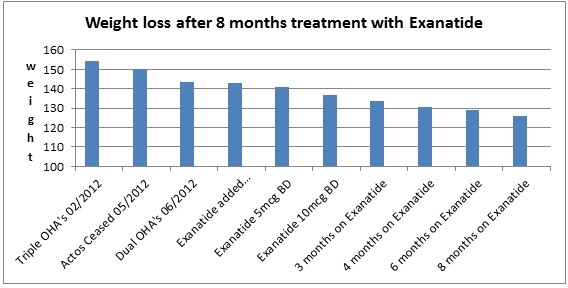 was commenced on Exanatide 5 mcg BD which was increased to 10 mcg BD after 2 months. M.G. experienced ongoing early satiety, reduced appetite and nausea which was managed with Metoclopramide 10mg tablets as needed. Her reduced appetite has resulted in a significantly reduced caloric intake. Diabetes education, emotional support and encouragement continued to be given to maintain motivation and to increase activity/walking. OUTCOMES: A total weight loss of 28.5 kg was achieved over a period of 8 months from commencement of Exanatide, current weight is 126 kg. Her diabetes control has remained stable and current HbA1c is 7%. M.G. is reporting an increase in confidence with daily activities such as housework and shopping, has increased energy and is able to walk without shortness of breath. M.G. is continuing to attend monthly review appointments with DNE, dietitian and GP. CONCLUSION: The addition of Exanatide to established dual OHA’s can be a very effective weight management therapy in a highly motivated client with an ongoing, regular support from members of the multi-disciplinary team ( DNE, Dietitian, GP, Endocrinologist).